By: Nikki Willett, Vice President of Product Marketing & Regulatory Affairs, Pilgrim Software, Inc. The food processing industry has done an incredible job in building new industrial automation systems to improve overall production processes – reducing time and cost and increasing overall throughput, product yields, and process efficiency. However, in the past 18 months the food industry has seen an unprecedented amount of supply chain safety and quality failures. In 2008, nationwide, annual estimates held steady at 87 million cases of food‐related illnesses, 371,000 hospitalizations and 5,700 deaths, according to the Centers for Disease Control and Prevention. These types of statistics have fueled a reduction in overall consumer confidence and increasing scrutiny by Senate committees, USDA, FDA, FSIS, EPA, EFSA, FAO/WHO, GFSI, etc. Food processing companies are also faced with the continuous challenge of maximizing food safety while adhering to the growing number of regulations: ISO 22000, FDA 21 CFR Part 110, FDA Bioterrorism Act of 2002, HACCP, SQF, BRC and others. Timely information about supplier controls and production process are required to analyze and detect processing trends of concern, and if needed, take immediate corrective action. As the food processing industry has become dependent on extended supply chains with multiple vendors, a multitude of variables can potentially impact processes adversely, including increasing prices, diverse standards among suppliers, geographic distance and tight timelines. As such, risk and quality management have become critical. 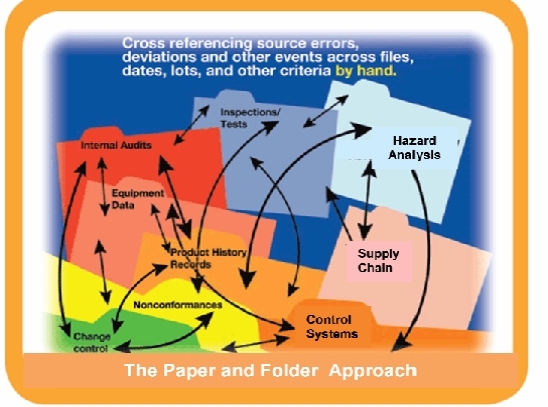 Yet most organizations still implement their Food Safety and Quality Management System in a paper‐based approach – generating and tracking a multitude of paper‐based documents throughout the process, leading to resource overload, untimely data and process inefficiencies. The long‐term, and at times, terminal impacts range from enormous costs incurred for failures (recalls, suspensions) and reduced or even destroyed retail and consumer confidence. The food industry must improve its safety record to maintain consumer good faith. Every time you improve quality, you will always increase the safety of food. So, how does this keep happening? At this point, too many organizations’ processes remain fragmented and disconnected. Procedures are not always well documented. Required process steps are not always completed. Employees don’t always know or understand their responsibility or authority. Not all source inputs to potential nonconformances are identified. Suppliers are not always closely monitored or enforced to continue their own quality process improvements. Companies tend to neglect looking into the processes and procedures of their food safety and quality systems. Their focusis on the food product rather than the efforts to resolve systemic issues, or they fast-forward to a solution without really identifying the “root cause”. These operational deficiencies are key contributors to recent events making headlines. Just this spring food contamination continued to draw the spotlightonto weaknesses in supply chain management and the food processing industry itself. “We recognize that we have reached a plateau in the prevention of food-borne disease, “Dr. Robert Tauxe, deputy director of the CDC’s Division of food-borne diseases, said during an April 2009 briefing. He called for new farm-to-fork efforts to evaluate food safety, including improved methods to quickly trace the source of contaminated produce. However, as of now, too many food processing companies are still having difficulty following and enforcing standard and consistent procedures, and having organization- wide trending data to predict quality and safety across all food products and processes. Moreover, a lack of good reporting and trending capabilities makes it difficult for top management to make accurate assessments about these issues, risks and especially costs facing the organization. Fortunately these can all be addressed through a combination of good quality planning, independent3rd party gap assessment audits, and automated systems. Companies need to take a look into the same principals of industrial automation and apply it to best practices in quality and safety management automation and think of the system as a whole – a global program, trained employees, well-documented SOP’s and utilizing technology properly to put global practices and procedures in place. Many players in the pharmaceutical industry, which closely parallels the food processing industry in many ways, we already recognized the benefits of an integrated, automated quality and safety platform. Planning and Documentation- The foundation of a successful Quality and Safety Management System is adequate planning and setup. You need to define Code Rules and Ownership. What are the rules and vacancies to the rules? What are the processes and who are the owners? How should we define severity levels for issues? Who will enter the information? Companies need to make the new system scalable, simple, risk-based, and easily integrated throughout the organization. Ensure that sufficient mechanisms are in place so that all steps are completed for each event. It’s very important that you determine the right people to involve in the Quality and Safety process and when. You will need to determine how procedure revisions will be handled and how you will enforce these rules and procedures on a global level. With good documentation standards and practices, and a fully automated document management and SOP training and enforcement system, companies can show a commitment to food and consumer safety which can assist a firm in defending itself if involved in any liability litigation. Error Tracking – Many companies have a lack of connected data sources. Alternatively, companies cross‐reference errors, deviations and other events across files, dates, lots and other criteria by hand, requiring a significant amount of time and opportunities for impacts and trends to be missed. This approach leads to serious inefficiencies and continued repetition of mistakes. The first step is to identify, collect and record any information that can occur anywhere throughout your product or process’s value‐chain. You will need to identify everything from problems that may occur in the supply chain, through the final processing, labeling and distribution lifecycle to any possible customer complaints. Key to recording problems is to drive to the root cause and focus on prevention and correction actions. The more knowledge you have, the faster you can react. Tracking problems will allow you to develop best practices and verify effectiveness. Without an integrated system, identifying root causes is little more than guesswork. Assumptions are made based on rumor and conjecture, rather than accurate, reliable data. Islands of information created by multiple data streams lead to inconsistencies and waste. Real measuring tools enable managers to determine precisely where and when mistakes are occurring and why. Auditing – With paper‐based solutions, the increase of suppliers and monitoring quality, performance and supplier systems becomes even more challenging. Minimizing the risk of liabilities, food processing companies need to have global visibility into their supplier performance across the entire organization and all their products to ensure consistency, quality control and compliance. But this means that organizations need to start focusing on global audit programs and planning. With paper‐based solutions, the approach to global planning becomes more resource and time intensive. How do you ensure rollout of a good audit program? Part of the nightmare is coming up with appropriate schedules for pre‐qualification as well as on‐going performance. With suppliers all over the world, limited resources in internal auditors or costly 3rd party auditors, and the availability of your supplier teams, initial scheduling and follow‐up scheduling can be a nightmare. How many times have you found yourselves constantly rescheduling because of conflicts? Or not realizing that follow‐up audits haven’t happened? 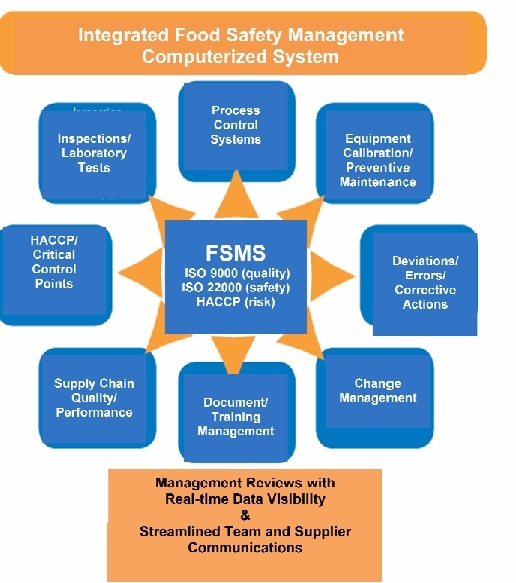 Automated central systems for supplier audits can provide a complete closed‐loop mechanism from checklists, to schedules, to findings and actions to follow‐up, helping to standardize and streamline your audit processes and cycles, and making your whole management and quality team more productive and efficient with complete traceability. No document overload! Simplified and consistent reporting. Trending, Analysis and Risk Management – Use the data you collect to detect minor problems quickly before they become major problems. However, change the behavior of the organization by applying risk techniques throughout the food safety and quality program. The progress of risk management has been seen in many companies implementing risk mitigation plans and assessing failures as part of the overall product processing and packaging cycle. However, such risk techniques have been left to the front or back part of the process, leaving each designated department to track, trend or analyze data individually. Progressive companies need to bring in and integrate risk techniques as part of the overall process to correctly categorize and prioritize those critical problems ‐‐ focus. This will help increase the view of critical problems to management, and help each department focus on the key areas of impact for both effectiveness and overall food safety and process improvement, moving an organization from reactive to proactive. Trending is still a key within an organization to monitor the pulse‐point of an organization’s overall health of its safety and quality systems. Implement measurement, data analysis tools, and processes for different levels of the organization. Assure that there are linkages between processes, safety and quality systems, and across multiple facility locations. Configure data such that problems related to supplier, process, or the quality system can be identified and acted upon quickly. Leverage as much information as possible to draw targets and assess effectiveness. Harmonization of sources, failure and root cause is essential to drawing meaningful conclusions. Re‐engineering processes will allow you to get rid of all the waste and inefficiency in your systems. Automated, simple and intuitive procedures and robust process architecture can result in quick navigation, to use and focus on problem solving, not navigating the maze of paper. With automated workflow (business rules engine), notifications and record tracking, companies can eliminate lengthy manual steps, streamline collaboration across the food value chain and improve their overall HACCP approach to reduce risk and improve overall food safety. 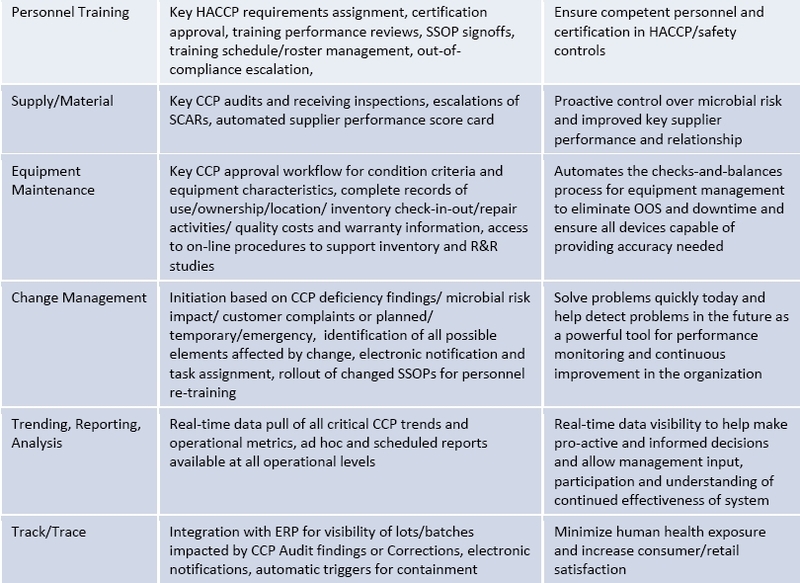 The below table provides an example of how companies can take many of the key information system components from ISO 22000 and see key results for HACCP from their process automation. In short, what are the benefits of automation for a Food Safety Management System? • Reduced overhead and waste – Reduced cost! It is all about boosting safety! It’s not enough to just have a great recipe. The trend now is of continuous process improvement and the implementation of an automated and integrated Safety and Quality system across the enterprise. A constant flow of information across your value chain can reduce time to diagnose and resolve problems, avoid supplier failures, and help to meet consumer expectations. A well‐designed and implemented safety and quality management system can reduce risk and improve performance and profitability.